How to recognize cancer warning signs and make the best decisions for care and treatment. Although that can be said for any disease, it is especially true for cancer. Over 14 million Americans are living beyond a cancer diagnosis. More than ever, there is reason for hope. Detected early, almost all cancers can be successfully treated. The key is to recognize cancer symptoms, get an accurate diagnosis, and select the treatment option that most effectively eliminates the cancer and prevents a recurrence. Introducing a new report from University Health News, Detecting Cancer: Breast cancer symptoms, skin cancer symptoms, colon cancer symptoms, cervical cancer symptoms, and more. You will find that, in many instances, the best defense is personal vigilance. By knowing what to look for, through regular self-examinations, you can detect changes and anomalies at the outset. In other instances, regular screenings offer more practical protection. There are certain cancers that exhibit fewer initial symptoms. In the Guide you learn about these cancers, their subtle symptoms, and the important role of regular physical examinations, blood work, and tests such as colonoscopies and mammograms, to provide the pathway to a timely diagnosis. This special report, Detecting Cancer: Breast cancer symptoms, skin cancer symptoms, colon cancer symptoms, cervical cancer symptoms, and more, will expand your understanding of controllable risk factors, introduce you to important advances in diagnostics, and meaningfully heighten your alertness to those cancer signs and symptoms that could pose a danger to your life and well-being. Understanding cancer symptoms begins with understanding cancer. 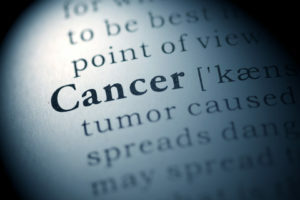 What is cancer? Cancer is the name given to a collection of related diseases. In all types of cancer, some of the body’s cells begin to divide without stopping and spread into surrounding tissues. Normally, the trillions of cells that make up our body follow an orderly course or growth, division, death, and replacement. As old cells become damaged and diet, new ones form to take their place. When cancer develops, however, this process breaks down. Sparked by genetic changes, cancer cells survive when they should die, and new cells form when they are not needed. These extra cells can divide without stopping, growing into tumors, invading nearby tissues, and forming new malignancies elsewhere in the body. Because of cancer’s nature, cancer signs and symptoms are rarely abrupt. Unlike a heart attack, for example, there’s no sudden sharp pain or quickly-occurring numbness. Symptoms can be slight at first and persistent only over time. The sooner diagnosis, the better the prognosis. Today’s treatment options, including targeted therapies, are more effectively addressing all forms of cancer, speeding remission, and improving survival rates. Caught early enough, even lung cancer is potentially curable—more than 430,000 people alive today have faced a lung cancer diagnosis. For your well-being, indeed, for your life, a prompt recognition of cancerous symptoms is essential. That’s why we are offering you this guide FREE. It is that important. Cancer claims more than 580,000 American lives each year. With increased awareness of these potentially deadly symptoms, swifter diagnosis and advances in treatment, you can protect yourself and loved ones as never before. Turn your self-knowledge into self-defense. The FREE Guide will help you recognize those changes that deserve attention. Who knows your body better than yourself? And yet, too often, we are tempted to ignore warning signs. It is easy to say “It’ll go away”…until it doesn’t. For example, fatigue, excessive sweating, and loss of appetite are three chronic leukemia symptoms. Often people with these symp-toms simply think they are “run down.” But the fact is, 50,000 new cases of leukemia occur each year. The Guide will fortify your readiness to respond to leukemia symptoms intelligently and quickly. You’re smart to be concerned about cancer symptoms. A basal cell carcinoma is the most common type of skin cancer. It’s also among the most curable when skin cancer is diagnosed promptly. Do you know its warning signs? Do you know how its symptoms differ from melanoma symptoms? The FREE Guide will tell you what to look for…where cancer is most likely to develop…and who is most at risk. Cervical cancer was once one of the leading causes of cancer death among American women. In the last 30 years, death from the disease have been cut in half due primarily to screening tests and preventive health examinations. What three common cervical cancer symptoms should prompt an immediate screening? The Guide has the answers. And did you know that only about 20 percent of stomach cancers are found in an early, more treatable stage? The FREE Guide, Detecting Cancer: Breast cancer symptoms, skin cancer symptoms, colon cancer symptoms, cervical cancer symptoms, and more, will alert you to those stomach cancer symptoms that are often dismissed but should be brought to your doctor’s attention as soon as possible. Knowing cancer’s symptoms is your most powerful weapon. Today’s treatment advances are remarkable. As researchers under-stand cancer’s genetic underpinnings, new, more effective treatments tailored to each patient’s individual cancer are conquering malignancies and saving lives. But, treatment cannot begin until there is a diagnosis. And a diagnosis, in turn, depends upon recognizing the symptoms and conveying your concerns to your doctor. An awareness of cancer symptoms and alertness to change are essential. That’s what makes this free guide such essential and empowering reading. Detecting Cancer comes to you from University Health News, the authoritative resource for health-conscious men and women. The Guide discusses the risk factors you can control and those you can’t. And it explains cancer symptoms in clear and uncomplicated terms. With your understanding of these symptoms, you will not only help yourself, but you may be able to help a friend or loved one as well. Does a relative complain about her persistent sore throat? Or per-haps a swelling of the lymph nodes in her neck? A sore throat that doesn’t go away is among the most common throat cancer warning signs. And swelling of the lymph nodes in the neck or armpit is the one of the hallmark lymphoma symptoms. The Guide will brief you on the role of the HPV vaccine in preventing cervical cancer…for whom it is appropriate…and for whom it is not. You will learn about three factors that can lower the risk of developing ovarian cancer. And you will read the current recommendations on mammogram screenings and the tests that will guide your physician in making treatment recommendations. This Guide to cancer symptoms provides the information that can change outcomes…the facts that can make the difference in detecting—and defeating—a cancer. Detecting Cancer: Breast cancer symptoms, skin cancer symptoms, colon cancer symptoms, cervical cancer symptoms, and more is yours to download absolutely free. P.S. According to the American Cancer Society’s Cancer Facts & Figures 2015, “Finding cancer at its earliest, most treatable stage gives patients the greatest chance of survival.” Please don’t wait. Download your free Guide right now. I thought you might be interested in this article on https://universityhealthnews.com: Detecting Cancer: Breast cancer symptoms, skin cancer symptoms, colon cancer symptoms, cervical cancer symptoms, and more.